Yesterday I bartended a Fourth of July party in Rolling Hills on the Palos Verdes Peninsula. I was excited to do this party because the host told me they had a great view of the whole Long Beach and San Pedro area from their backyard and could see several fireworks shows from there. I love Independence Day – it is my favorite holiday, and I love fireworks, and I love bartending. I got this job from another job I did last month in Rolling Hills. There is nothing better than getting a referral, or getting a job from handing out a business card. That is the best kind of business for me, because I have to pay for leads and advertising for everything else. I had to start my business from scratch, and now after four years, I am getting a lot of repeat business and referrals. I got down to area early and had some time to kill. I was right by the Green Hills Cemetery and I remembered that Charles Bukowski,one of my favorite writers is buried there. People often visit his grave and pour bottles of beer and whiskey into the ground as a tribute. I figured it shouldn’t be too hard to find the gravesite. I walked into the cemetery and quickly realized it would be like finding a needle in a haystack. I saw a cemetery employee driving a golf cart and I stopped her and asked he where the grave site was. She was kind enough to drive me right to it. It had some beer bottles on it and cigarettes. I was unprepared and had nothing to offer. I hope I am not jinxed! The party went very well and I served Mojitos. Old Fashioneds, beer, and wine to approximately 50 guests. It was a very nice relaxed party with a great group of people. When the sun went down the fireworks started and they lit up the whole harbor area and Southbay. I think that this year there were way more “illegal” fireworks than I have ever seen before. Even as I was driving home on the 405 they were lighting up the sky at midnight. I love it – allow us our freedom once a year! Friday I am bartending a wedding in San Diego, and then on Sunday I am doing a wedding at an exotic animal ranch in Sylmar. On Monday I leave for Montana and Wyoming for a week. The summer will be gone before we know it. Shaken Not Stirred traveled all over Southern California last weekend and provided bartending service for two important milestone birthdays. On Friday I drove to Chino to bartend for a sweet 16 birthday party, and then on Saturday I drove the opposite direction to bartend a 70th birthday party at Channel Islands Harbor. I had another bartender do an event in Villa Park as well. It was the start of the Fourth of July weekend and traffic in Socal was a bear. The host in Chino rented tables and chairs and set up for over 100 people in the backyard of his home. I served alcoholic beverages to approximately 40 guests, and there were about 60 minors who I served soft drinks to. Johnny Walker Black was the number one drink of choice, and the thing about that is people either drink it on the rocks, or with soda. No fancy mixology involved. The hosts and all of the guests were of Indian heritage and the food served was 100 percent vegetarian. Raul’s Catering of Rialto provided the tacos and burritos and he told me that he specializes in vegetarian food for Indian themed parties. I am not a vegetarian myself, and am reluctant to try vegetarian food, but Raul’s vegetarian chorizo burritos were spicy and excellent. Had he not told me they were vegetarian, I would not have known. It took me over two hours to drive to Chino, and an hour to drive home. 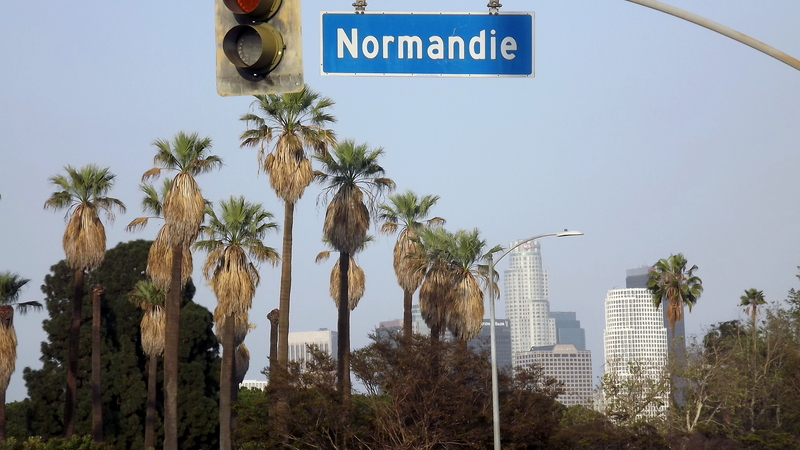 On Saturday, it took two hours to drive to Oxnard as well. Fourth of July weekend is a terrible time to drive anywhere in Southern California. I always leave way early. The party at Channel Islands Harbor was originally going to have 80 guests, and then two weeks before the event, the host bumped it t0 150 guests. I needed to hire an extra bartender, but could not find anyone last minute in Los Angeles, so I turned to Craigslist. I have had mixed luck hiring people on Craigslist in the past. I usually ask for a picture and resume. I want to see if the people look presentable. I got a few responses, but most of the people can barely write a legible response. They write things like, sup, how much in tips will I make, and they don’t include a picture. One guy wrote a very intelligent response and included a picture, so I hired him over the phone. On the day of the event, I texted the guy in the morning to confirm he would be there. He responded yes, so I felt I had nothing to worry about. I got to the location at the harbor and started setting up and one half hour before the bar back was supposed to be there, I got a text from him saying he was being pulled over by the police and that he had warrants and was probably going to be arrested. I had to scramble to find somebody else. I asked one of the servers there if she knew anybody and she did! Her brother could do it. I started serving the guests at 4pm and the replacement barback showed up just in time at 5pm. We did not stop serving drinks for six hours straight. I must have made 600 drinks myself, and thank God the other guy showed up to help me. The party was to celebrate the 70th bithday party of a very revered man and former fire captain of Oxnard, and many of the guests were firemen that worked for him. It was a great event and they had a live band and Polynesian dancers for entertainment, but I was too busy making drinks to even pay attention. Tomorrow is Independence Day and I am bartending a party in Rolling Hills, at a home that has excellent views of the San Pedro fireworks show, and the Long Beach fireworks, so I am looking forward to that. Friday I am going to San Diego to do a wedding, and then on Saturday I am doing a wedding at an exotic animal ranch in Sylmar. Please follow me on Instagram. Shaken Not Stirred, Los Angeles based mobile bartender did a three day tour of Southern California last weekend, completing gigs in San Diego, Sherman Oaks, and Long Beach. I made hundreds of drinks at three different parties, and met lots of new people. Each party was completely different, as were the drinks that I served. I drove to San Diego on Thursday to do some marketing work for Geranium Street USA in Escondido, and I had the birthday party to bartend on Friday, so I killed two birds with one stone. The birthday party was in the Scripps Ranch neighborhood of San Diego at a nice home that overlooked the reservoir there. Rain was imminent, so plans changed and I set up my portable bar inside the house. 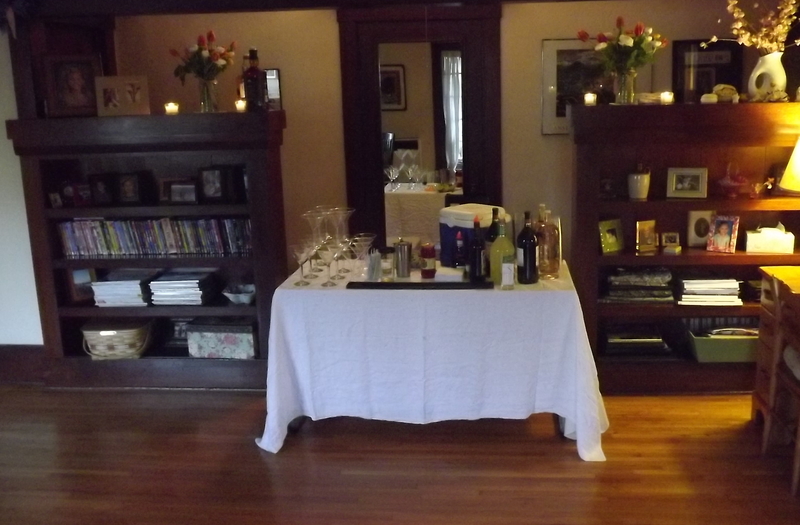 I served Old Fashioneds, Moscow Mules, and lot’s or red wine to the guests – many who came all the way from Minnesota. They had live entertainment for the party and guitar player/singer Kenny Earnest performed for several hours. He was really good. Phil’s Barbeque of San Diego provided the catering and it was excellent as well. The host said that she had never hired a bartender before and she was really happy with my service. She said it made her time much more enjoyable. Most people I work for say the same. 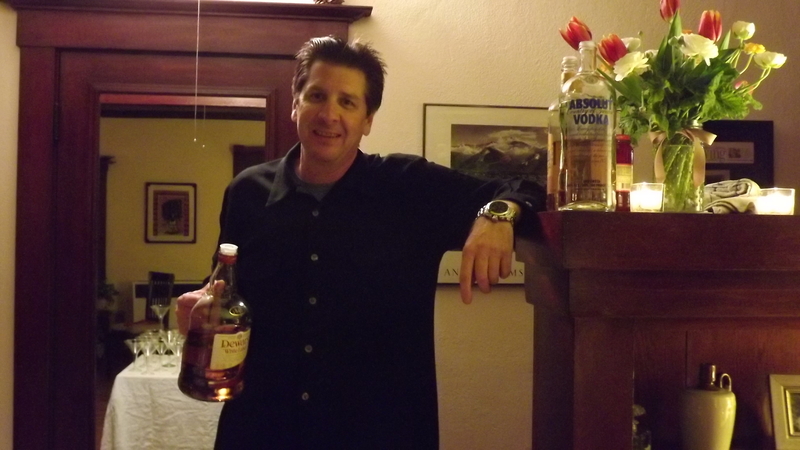 On Saturday I drove back to my home turf in the San Fernando Valley to bartend a 40th birthday party in Sherman Oaks. The host had attended another party I had done, and hired me because of that. The 40th birthday party is kind of a big deal in a man’s life. I think that is when most of realize we finally have to grow up. Once again, it was supposed to rain, so the hosts had to get a tent to cover their back yard. They had it decorated very nice. I made Manhattans, Moscow Mules, and my famous Jalapeno Margaritas. I kept pretty busy and barely had a moment to spare as the line just kept rotating. I would guess there were around 80 guests. They had a Karaoke vendor there and people were singing with various levels of competence. It was a very good time for all. One of the neighbors came over and complained – said that he had a four and half month old child that couldn’t sleep. That was at 8:30. The host offered him a taco and basically told him politely to “deal with it.” I’m glad that she didn’t cave into the neighbor’s ridiculous complaint. People should be allowed to have an occasional party in their backyard on a Saturday night, without having neighbors in an uproar. Ana’s Food provided the taco cart. At one point I was able to take a break and got some tacos. I went back to the bar and started to eat them, but then accidentally dropped them. I was so mad at myself. Luckily, a guests wents and got me some more. The party ended at midnight, despite the complaining neighbor. On Sunday, I once again put on my mobile bartender cape and drove to Long Beach. The party was held at an historic old home on Ocean Blvd., right across from the beach. The host rents the front part of the home on AirB&B and it is a very nice spot. They have a tennis court in the back and a bar, and that is where the party was held. I served Grasshoppers, Pina Colladas, Mai Tais, and Mimosas. They hired a private chef, and his food was excellent. I had a quail’s egg soup that was out of this world – also great ceviche, egg rolls, and lamb chops. It was quite a party and many of the guests took my card and are planning parties in the future. Next weekend will be another mobile bartender tour of Orange County and Burbank. I have a wedding on Friday night in San Juan Capistrano, a birthday party on Saturday in Laguna Nigel, and a Bar Mitzva on Sunday in Burbank. Follow me on Facebook if you haven’t done so already. 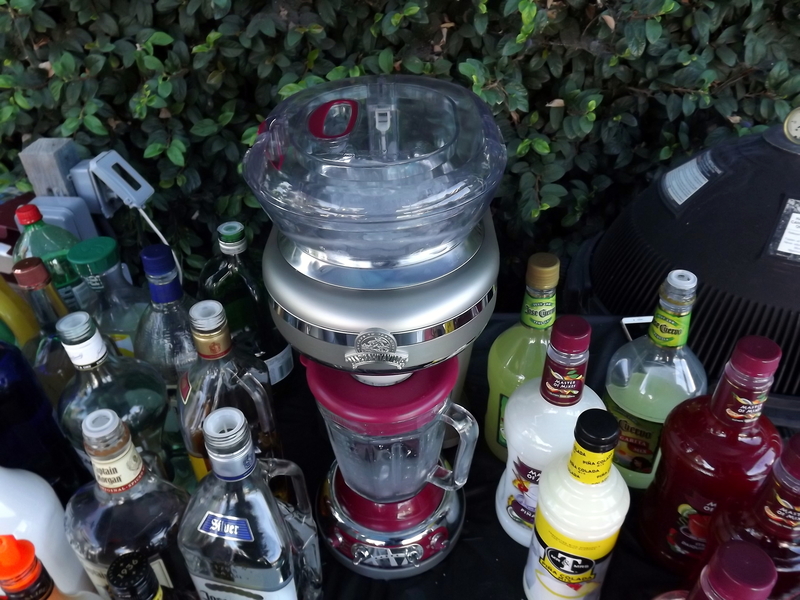 Last weekend Shaken Not stirred, the Los Angeles based mobile bartender service traveled to Stevenson Ranch and the city of La Verne to bartend. The month of January is traditionally slow as people are recovering from all the holiday parties, and then in February people get back into the swing of things when it comes to partying. I provided bartending services in Stevenson Ranch for a wake of sorts, and then on Sunday went to La Verne to bartend a Super Bowl Party. 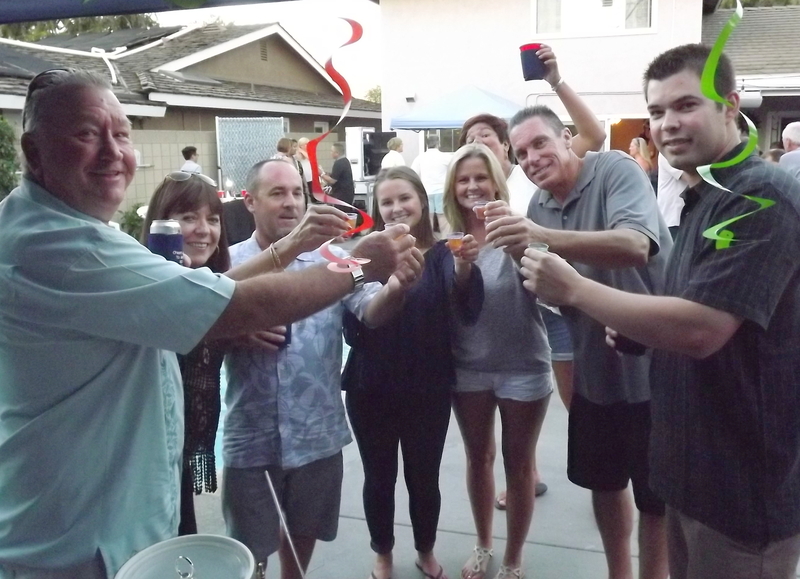 The party in Stevenson Ranch was a home of a repeat customer. I bartended a birthday party for her boyfriend last year and then she called me back to bartend a party she was having as a remembrance for her father who recently passed. Her father was only 54, which is the age I will be next month. It made me feel extremely grateful that I am in excellent health and that is something I should never take for granted. The Stevenson Ranch party got started late as many of the guests work in the car business. I have worked in the car business myself and that means late weekends and long hours. Car business people work hard and a lot of of them play hard too. I know that from experience. I set up my portable bar in the backyard and served jalapeno margaritas and a lot of Crowne Royal until nearly 2am. 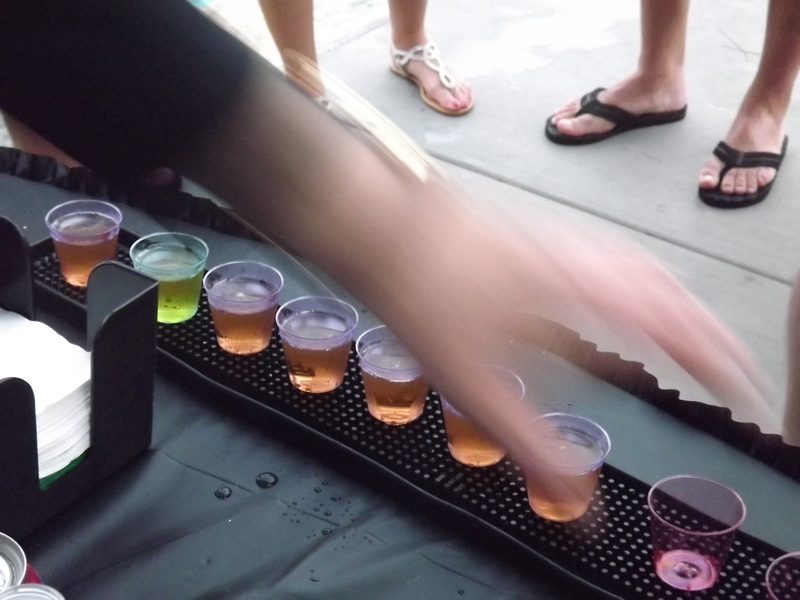 Why Hire a Mobile Bartender? For the past two years I was the bartender at a huge Glendora Super Bowl party, but for some reason they decided not to have it this year. I thought another good client of mine was going to have a Super Bowl party this year and I turned down other offers. Well, a week before the Super Bowl, I still did not have a party. I finally picked one up last minute in the city of La Verne. I had never been to La Verne but it is pretty close to Glendora. The client’s home was in a very nice gated community right next to the Mountains. I set up my portable bar next to the swimming pool. They also hired a taco cart to do the food. I had a view of the game from where I was standing, but barely had a minute to spare I made so many drinks. I made a lot of shots too and went through five or six handles of Tito’s. This coming weekend I have three parties starting on Friday in San Diego, back to Sherman Oaks on Saturday to bartend a birthday party and then on Sunday I have a party in the city of Long Beach. It will be a busy weekend for the mobile bartender. Please follow me on Facebook if you haven’t done so already. Friday, I drove to Palm Springs for my second time as a bachelorette party bartender. Palm Springs seems to be the place that ladies from LA like to go for their bachelorette parties. Do you realize how hard it is to spell bachelorette? 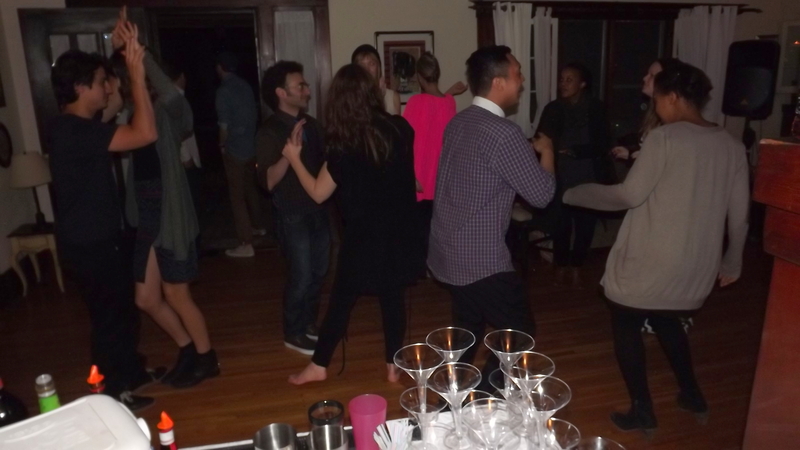 Anyway, there are many cool houses for weekend rentals that are perfect for this type of party. This particular house had a nice indoor bar with a sliding window that opened up to the pool area, so that people at the pool can come up and order drinks. I worked with hosts of the party developing a drink menu. They requested the Katsuya Fresh as one of the specialty drinks. It was my first time making this cocktail, and it seemed to be a hit. There were nine ladies in attendance and we went through 3 bottles of vodka. The Katsuya Fresh is made with vodka, fresh lime juice, sake, and simple syrup. I also served spicy jalapeno margaritas, and gray hounds. The ladies asked me to help them start the grill, and as I did that, I decided I would grill for them. This was my first time as grill master, and I really don’t have too much experience doing it, but I think I did ok. I would rather be busy than just standing behind the bar, and let the hosts enjoy themselves. I hope they were happy with my grilling, and I am afraid I didn’t cook the vegetables and corn long enough. There are some tricks to good grilling, and I should learn them, in case I run into this situation again. The ladies were surprised that I came all the way from Los Angeles to bartend a party in Palm Springs. I bartend in Palm springs because I like going out there. I can usually drive to Palm Springs quicker than I can drive to Orange County. 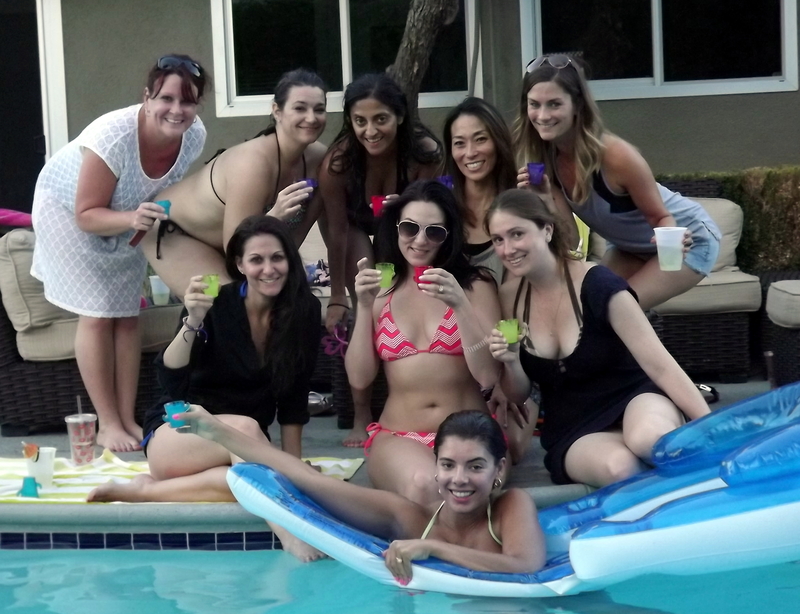 I hope to be the bachelorette party bartender in Palm Springs on many more occasions. I am quickly writing this, because I have to get ready for another event in Long Beach this afternoon. It is a 60th birthday party, and the second party I have done for this same client. I am taking a server with me also. Next weekend I have a big wedding in Malibu, and am taking three servers with me on that one. Summer is flying by and I am already booking parties into the holiday season. is fierce in LA, but Shaken Not Stirred is steadily making a foothold in Southern California. Last night, I bartended a birthday party at a very cool Victorian home in the West Adams neighborhood, south of Koreatown. The host was throwing a party for his girlfriend and I heard her say it was her first birthday party since becoming an adult. They had caterers there set up outside and they served some very good tacos. I had a makeshift bar set up inside, which was a folding table with a table cloth. I have inserted a picture to show that this set up works just fine. The host also hired a DJ who was one of his personal friends, and the guy really made the party. I have been looking for a DJ to highly recommend, and I think I have finally found him. The name of his company is “Ten foot Rabbit”. The DJ’s girlfriend assisted him, and she not only helped him set up his equipment, but she mingled and engaged with people in the crowd and got them dancing. As the night progressed, the dance floor was packed, which made for a successful party. Here is a link to the DJ’s Facebook page. At the request of the birthday girl, I served Rob Roy’s and Manhattans. Those are both classic cocktails and definitely an acquired taste, but were a hit with this crowd. 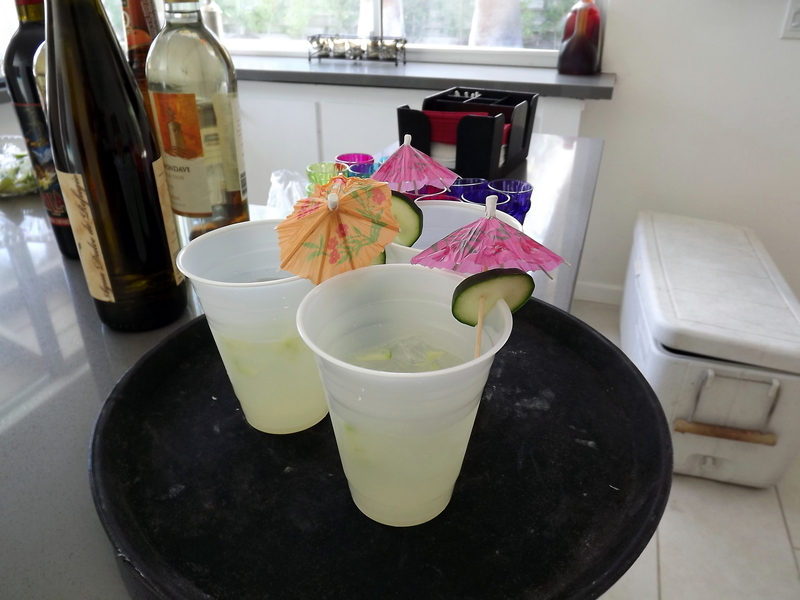 I also served Cadillac Margaritas, which are always popular. In case you didn’t know, you need Gran Marnier to make a Margarita “Cadillac” and it really makes a big difference in taste. Coming in third at the party for cocktails was the Cosmopolitan. I brought some real martini glasses, and they seem to make the drinks so much better. At least they look better. Next weekend I still have open and am hoping to book a gig. I probably will before Saturday, as many people wait until the last moment. So far I have almost every weekend booked in April, and I have been working with people back and forth for weddings as far away as September. I have been creeping up in Google searches and the phone is starting to ring from that alone, which was the goal.